NEWBURY — By day, Stephen Banatoski manages the actuarial data unit at a financial services company. In his spare time, he hefts enormous iron pots of stew for His Majesty’s 10th Regiment of Foot, a team of history buffs who participate in Revolutionary War reenactments throughout the Northeast. 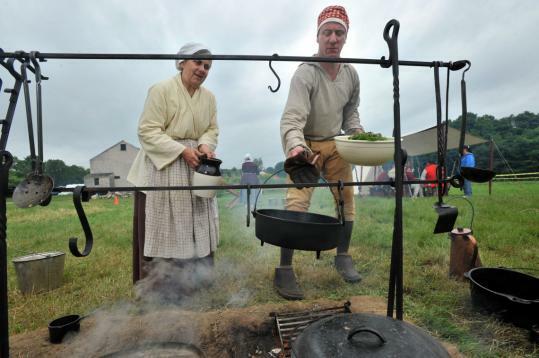 At a recent reenactment at Spencer-Peirce-Little Farm here, Banatoski, who is the cook, offers lunch centered around a seafood chowder that he lovingly prepares using ingredients and techniques authentic to 1775, a year when the actual regiment saw battle. In a Dutch oven over an open fire, Banatoski starts his chowder by rendering bacon. To this he adds onions, and their smell fills the air as fifes and drums play in the background. A light drizzle falls into open pots of water kept simmering for coffee, tea, and washing, and a blaze of red strawberries starkly contrast with their iron container. When the chowder is nearly finished, the cook adds handfuls of fresh herbs before the regiment, armed with wooden bowls and spoons carved from horn, devours it. Dinner would feature steamed greens, barley simmered in stock, beef and ginger beer stew, strawberry rhubarb crisp, and cranberry and apple dried fruit pie. The group admits to enjoying certain culinary privileges over their ancestors. “We’re eating a lot of the things that they ate, we’re just eating the good stuff more often,’’ says Lexington resident Paul O’Shaughnessy, the commanding officer. The only giveaway to modern times is some half-and-half for the chowder poured from a Price Chopper carton. Besides iron, other implements are earthenware and designed to feed dozens. Banatoski is clad in a loose, open-necked top, with a red-and-white checked cotton cap, and mustard-colored trousers that come to his knees, over brown stockings. Always in motion, the 6-foot-6 Maynard resident is an energetic presence on the scene, stoking the fire by breathing through a hollow iron blow tube and hauling pails of water on a yoke across his shoulders. Banatoski became involved in the reenactments through his twin 14-year-old sons, who wanted to learn period drumming. “The way we picked the [British] side was that my kids liked the uniform,’’ he says. The regiment gushes about the quality of the food, but theirs is not the only cook tackling an ambitious menu. The cook for the adjacent 9th of Foot is spit-roasting Cornish game hens, basted with butter and Madeira. Not that there haven’t been disasters in the past, including scorched corn bread, another dish Banatoski’s crew refers to as beef water, and something dubbed purple rabbit surprise. Among the cook’s triumphs are cod cakes, parsnip fritters, leg of lamb, and carrot pudding. Next he plans to tackle whole fish roasted on a wood plank, kept in place with nails and string. When baking, Banatoski collaborates with fellow regiment member Deb Fate-Mental of Mendon. To make the crust for her dried fruit pie, Fate-Mental, an herbalist by trade, uses both wheat and rye flour. The filling is dried apples and cranberries soaked in warm water; their concentrated sugars are the only sweetener. The heavy Dutch oven is placed on a stout, three-legged iron trivet that straddles a bed of glowing coals. Another trivet is placed inside the pot, and an earthenware pie plate sits on this. Additional coals are shoveled on the lid, and the pie bakes in the hot, dry space within. “Does that look like 375 to you?’’ asks Banatoski, buttressing the arrangement with fresh coals. Fate-Mental nods. Later they find a perfectly baked, golden brown pie. The crust is moist, tender, and flaky, and the rye imparts an earthy, rustic quality. The filling is sweet and tart, the slightly firm, rehydrated apples tasting surprisingly like fresh ones. “It’s the reason why we all show up’’ says Edward Scull, a sergeant eating spoonfuls of the beef and ginger beer stew. “Yeah, it’s not for the shooting, it’s for the food,’’ adds his commanding officer. The 10th Regiment of Foot is participating in a parade on July 5 at 10 a.m. ending at Chelmsford Town Hall, 50 Billerica Road, Chelmsford.